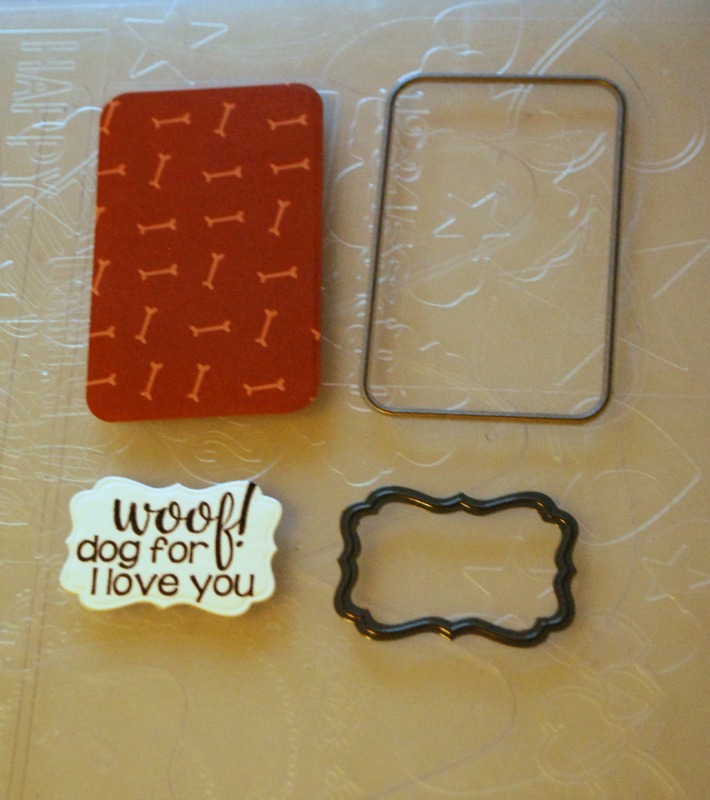 Hi, Crafty Friends... 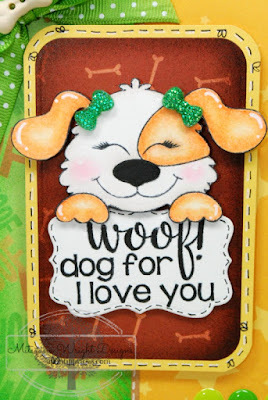 I have an adorable card for you today! I am so loving these new interchangeable faces from Pink & Main's "Sweet Faces" Collection!! I love being able to customize these little cuties. It's amazing how not only changing the faces but also positioning the faces (either higher, lower, or more to one side) can change the look of each character. 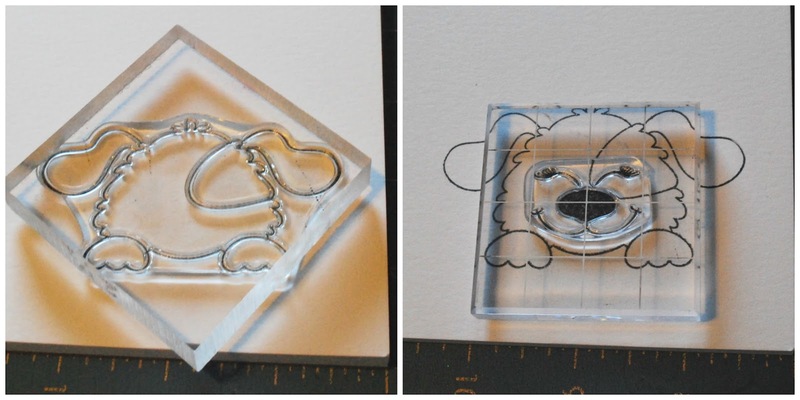 I am just over the moon excited about these sets ( I hope it's not too obvious, LOL)!! 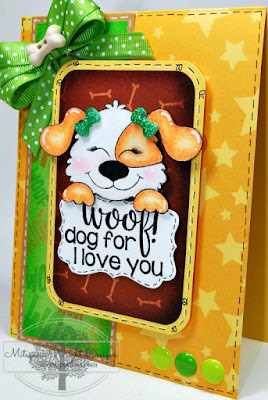 Here is a card I made using the puppy head from the Animal Faces set with the squinty animal face from the Sweet Faces Set 2. I stamped my image using Momento Tuxedo Black ink. First, I stamped the head. Then I stamped the face. For this particular face, I wanted the nose to be touching the patch around the eye. Next, I used my Spectrum Noir color pencil to outline the paws, ears, and patch. I used odorless thinner to blend the color pencil out, Then I added a tiny bit of pink chalk onto the cheeks for blush and used a white opaque marker for highlights. After my puppy was colored, I used a scissors to cut out my image. 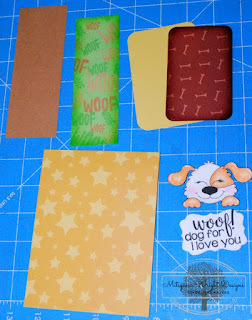 I stamped out my sentiment and used my Darice Nested Rectangles dies to cut it out. 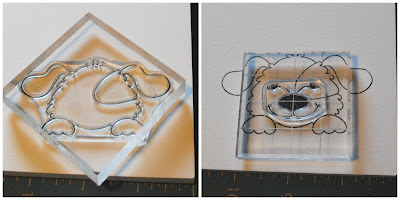 I used my rounded rectangle die from my Die-namics Blueprints 14 die set. 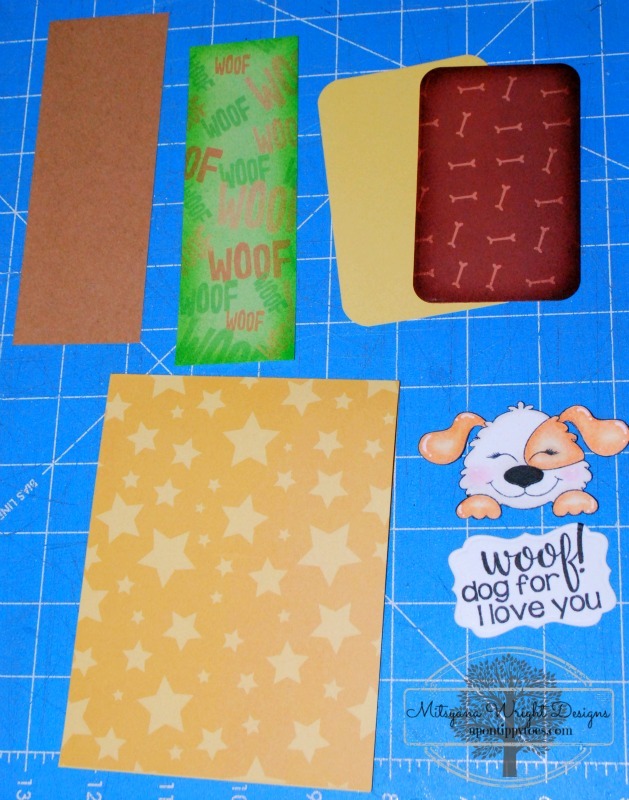 I cut a strip of craft cardstock to 2" x 5-1/2"... and a mat from patterned paper 1-3/4"x 5". Then I also cut another piece of patterned paper 2-5/8"x 4" to mat the rounded rectangle piece. 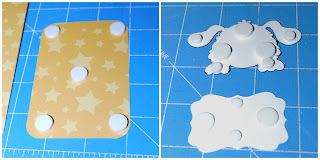 Then I airbrushed my patterned paper pieces with my ebrush machine. 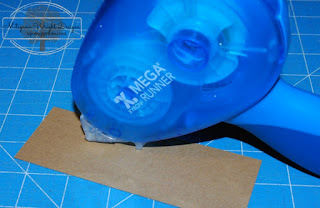 I used my Xyron Mega Runner to attach all the panels together onto my A2 (4-1/4"x 5-1/2") card base. 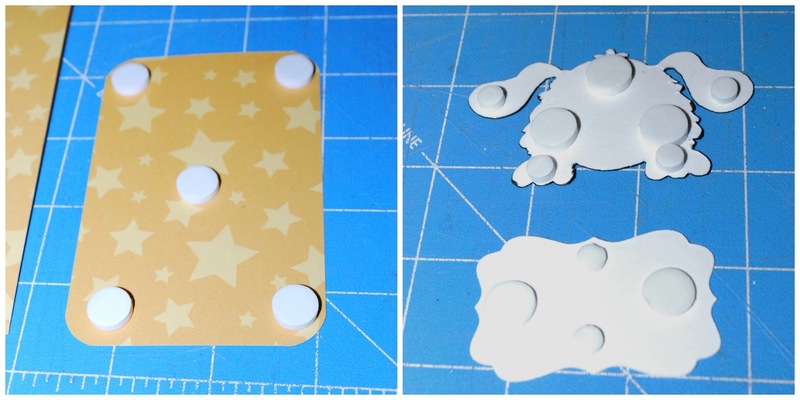 For added dimension, I added foam adhesive dots behind these pieces before attaching them to my card front. Lastly, I made a triple looped bow and attached a bone shaped button to the center. 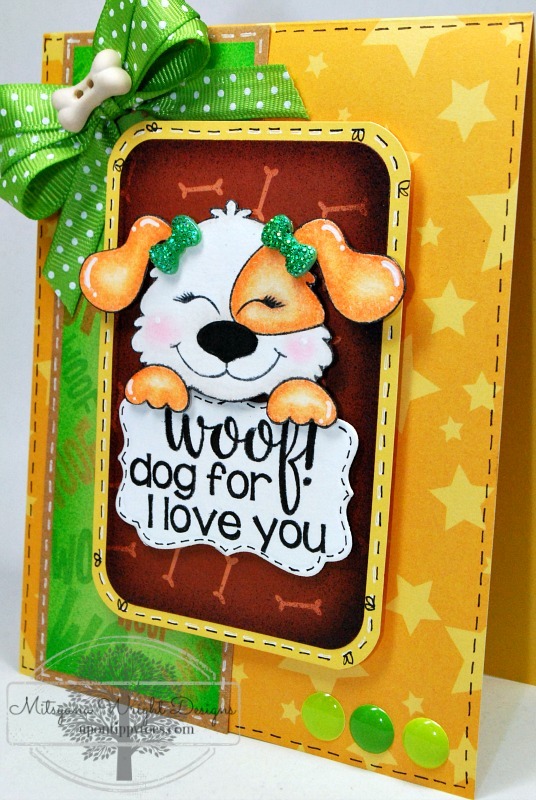 Then I used 3D Laquer to arrach the bow to my card. I love to make my characters girls for some reason and it super easy to do! 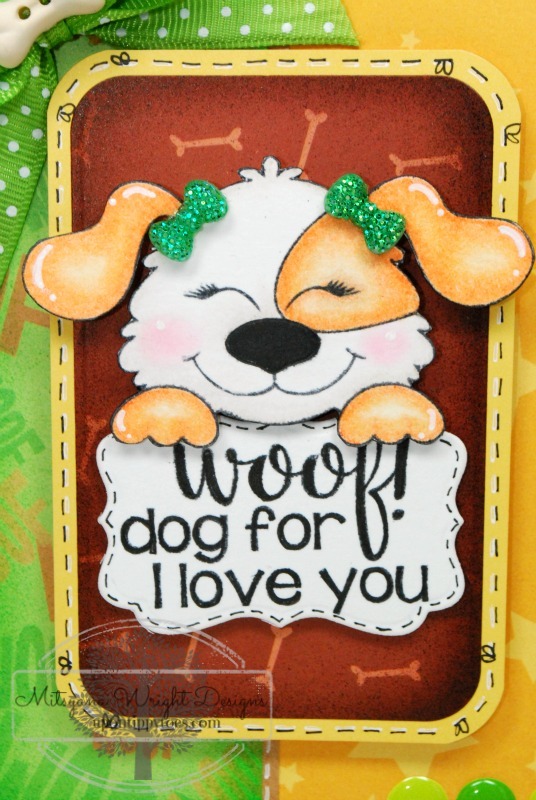 I just attached a bow onto each puppy dog ear and presto... a cute little girl puppy!! I really hope you enjoyed today's card!! I absolutely love everything you create!! This is ADORABLE!! Thank you so much, Shannon!! Very cute - love all the details, matching bows, little bones, coordinating colors! Aw, shucks... thank you, Mary! !